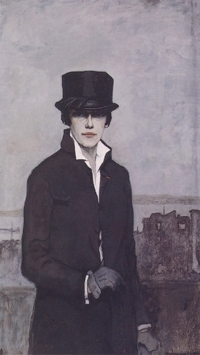 Romaine Brooks painted portraits which were tremendously revealing about their sitters’ personalities. Brooks studied painting in Italy from 1896 to 1899 and then lived on the isle of Capri, where she established a studio. After a brief marriage to John Ellingham Brooks, she moved to Paris in 1905 and became friends with artists and writers. She met her partner Natalie Clifford Barney in 1915 and about five years later painted one of her most significant works, The Amazon, a portrait of Barney. During the 1920s, her work was shown internationally but afterward was rarely seen until a 1971 exhibition at the National Collection of Fine Arts. Romaine Brooks. Self-Portrait, 1923. Smithsonian American Art Museum, Washington, D.C.